Repair & Restoration isn't Mutt's only passions. He likes to go fast also. 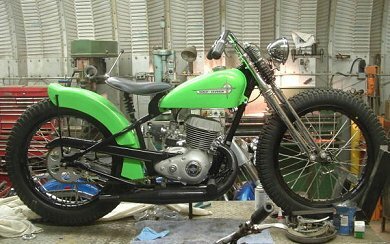 Having access to a complete shop and a network of suppliers and friends lead his tempatation to build the following motorcycle. I'll let him tell you the story in his own words. Hello all, just thought y'all might like to see my bike that's destined to be the world's FASTEST Hummer !!!!!! -Stock frame and tank per AMCA rules (I did add an extra cross bar from the neck to the seat for rigidity). -18" Rear wheel , aluminum rim, s/s spokes, 70's chopper spool hub, NOS GoodYear R/T 3.50 x 18" 4 ply tire and tube. -19" front wheel, aluminum rim, s/s spokes, My own fab'd spool hub, NOS GoodYear R/T 3.25 x 19" 4 ply tire and tube. -Chromed 1926 B model "PeaShooter" springer front fork, completely refurbished by me. -1949 Panhead spotlight with NOS GREEN lens. -Handlebars hand fab'd by me with Knucklehead grips. -Quick release S/S & Brass industrial petock (will NEVER leak). -1946 Mustang solo seat with fab'd monoshock damping system and seat T assembly and modified original seat mounting bracket. -1960's MECHANICAL disc brake from a go-kart, I machined all the clevis' and linkage. -My own design forward controls and stock -52 footpegs. 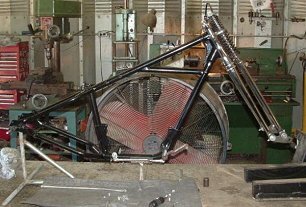 -My own hand fab'd Exact copy of the -59X Harley Davidson prototype expansion chamber (Thanks Eddie B.) and the custom machined finned exhaust clamp I did. The entire bike is powdercoated. -NOS WebCo 10.4:1 compression racing head, combustion chamber Titanium Ceramic-coated. -Custom piston, window machined, Titanium Ceramic coated crown and moly'd skirt and inside. -Carbide plated bore, Intake ported/polished to 30mm, exhaust port ported and recontoured for a much smaller i.d. -New 30mm Del Orto PHBH carb and aircleaner. 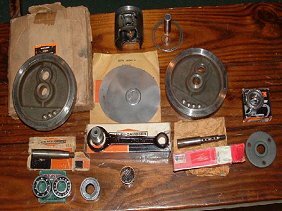 -NOS -59R 2nd close ratio Racing gear set (Thanks Mike Lewis). 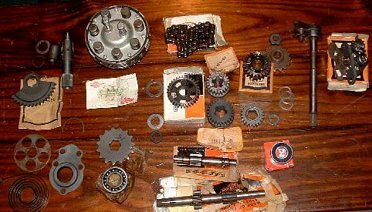 -NOS -62R 3rd EXTRA close ratio Racing gear set (Thanks to Tom Van Beek for the 24 tooth and to NICK for it's 21 tooth mate). 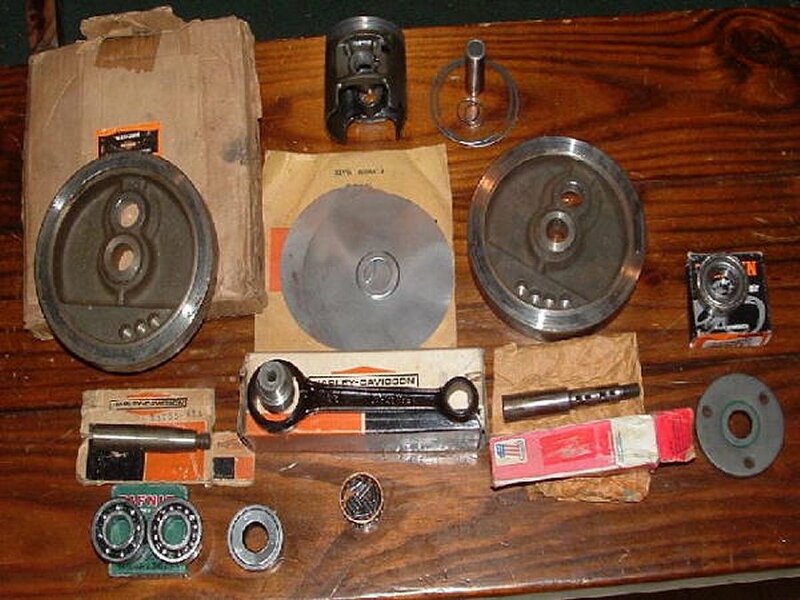 -NOS -66R racing magneto and cam. 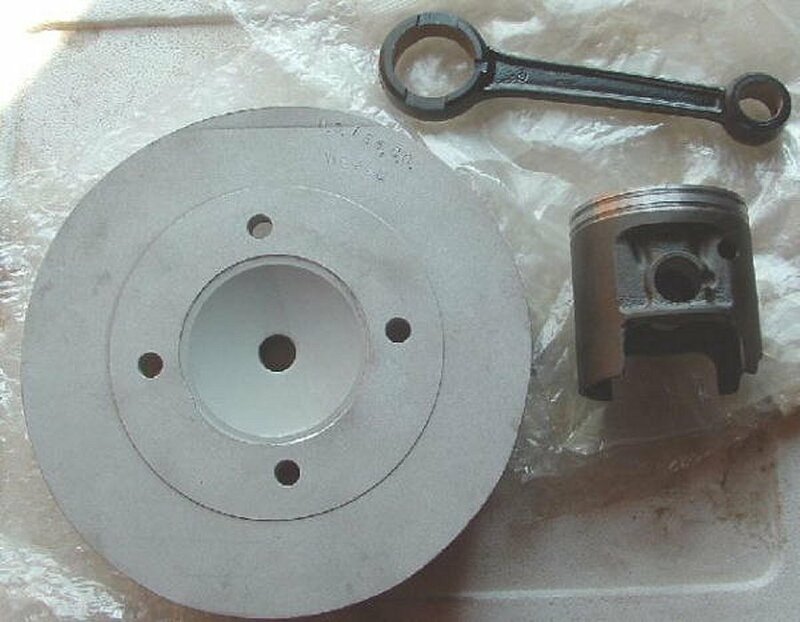 -Crankcase is 'stuffed' and the ports are super extended, NOS -64A connecting rod with Tungsten Ceramic-coated conrod (Thanks Tanno). As you can see, the entire motor/trans/clutch top end/etc. is new or NOS. I used double lip seals throuhout the motor and trans so it won't be leaking. 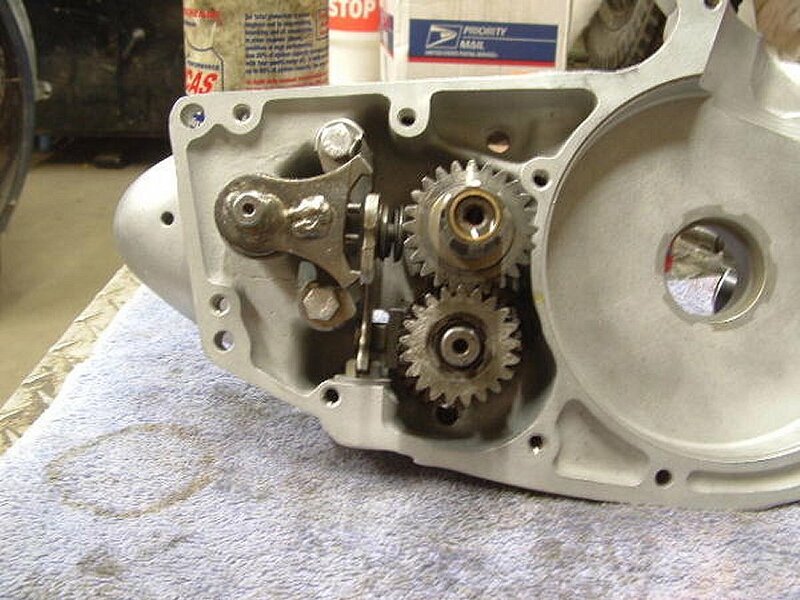 15 tooth motor and trans sprockets , 31 tooth clutch sprocket, extra heavy link #35 Diamond primary chain, and quick change rear wheel sprockets. so I will be happy to post the specs such as rpm/hp/carb/top speed after the bike is dialed in. I finished the bike up Thursday night, just a few hours before the 11th Annual PigStye Pasture Party. One or 2 fellow Hummer-ites were there to hear it run on it's maiden start up. 14:1 compression is fun to kick over !!!!! 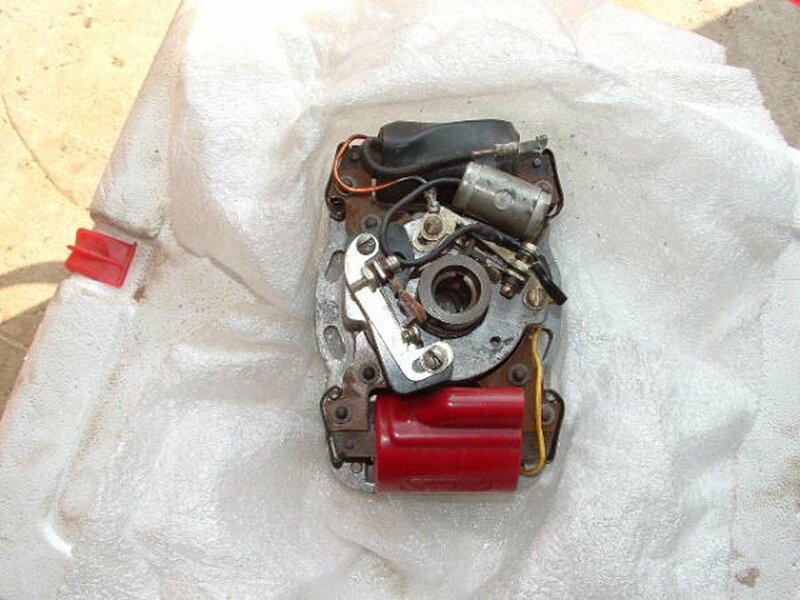 According to the computer program, the motor should turn between 10,000-10,500 rpm and dump out 22 ponies. Ask some one that was here and heard it run what they think. Man, this thing has a great powerband and turns so fast it hurts your ears ( aye, Carl ?!!!!!!!!!!!!!) 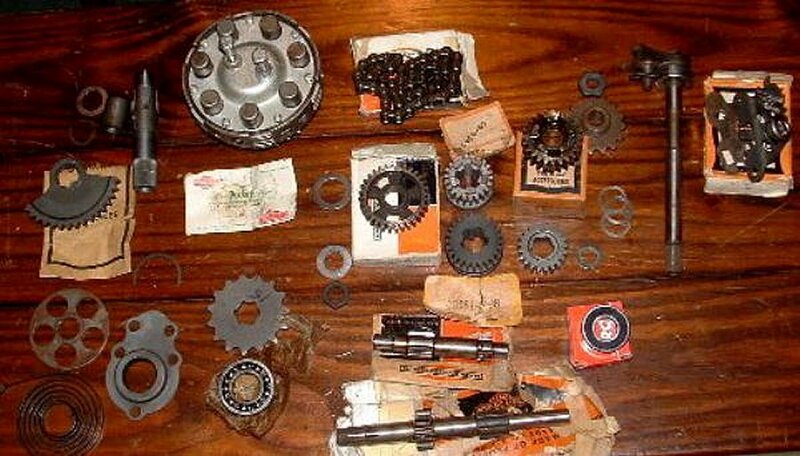 Here is a pic of the extremely obsolete -62R extra close ratio 3rd gear set. It's hard to juggle restoring everyones bikes, motors, & parts and still find time to work on my own stuff. Usually 9 a.m. to 6 p.m. then I work on my own stuff 'til 9 p.m. Then I have the never ending 'Honey-Do' list to deal with also. Here is the NOS -66R racing magneto I am using. Instead of using dual cams and dual points, I just used a NOS standard -55 points cam and single set of points. The cool red ignition coil bears a -63R part # and is a high output coil designed for high rpm racing motors. 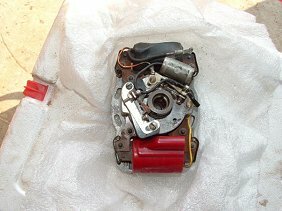 Here is a pic of the NOS WebCo head, rod and piston. so closer tolerences can be employed and motor noises are a minimum. Notice the combustion chamber(actually the lack thereof !!!!) VERY shallow. Here is the start of the assembly. 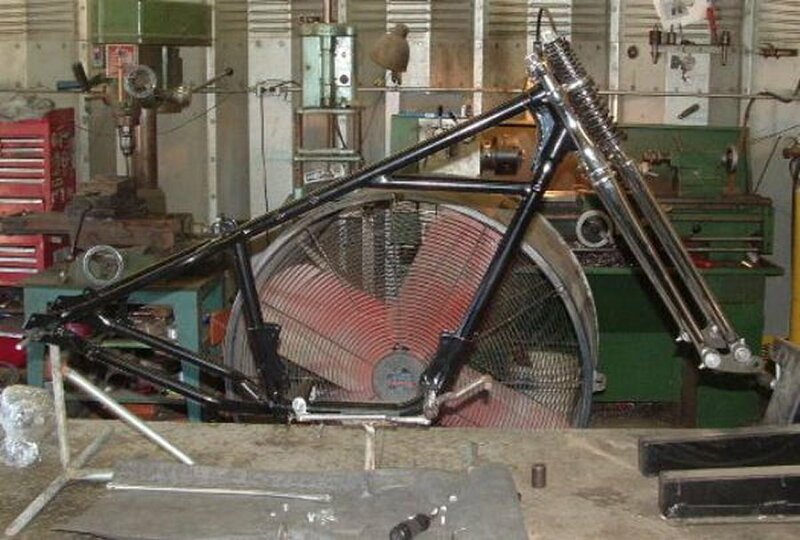 The springer installed as well as the linkage for the rear mechanical disc brake. Note the added frame cross brace (sets flush with the bottom of the tank). No, the forks are still standard length. for these Peashooter forks as they were less than half the weight. Here is a shot of the mechanical disc brake caliper and linkage. We are in the works of putting in a track here in my pasture. I got 55 acres of pasture and another 10 of woods. We are shootin' for the biggest possible track. That way, we plan to do vintage races at least once a month and practice any time we feel like it !!! 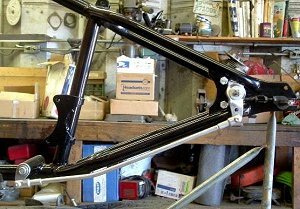 Here are pictures of some of the other parts that went into the building of this bike. it's also a work in progress. Mutt has since changed out the head and the rear caliper.